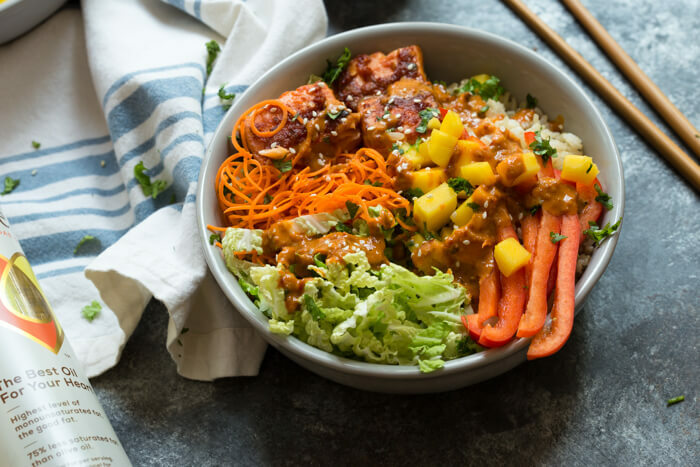 Spicy Thai Salmon Grain Bowls loaded with veggies, brown basmati rice and warm baked salmon and a drizzle of spicy Thai sauce. Meals are better in bowl form…AMIRIGHT? 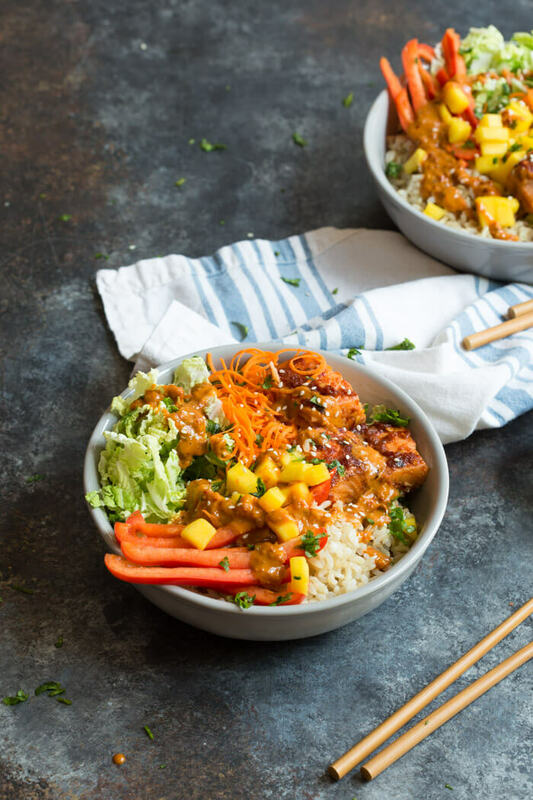 These Spicy Thai Salmon Grain Bowls are easily customizable if you want more or less of an ingredient–you decide! I like building bowls with a base of hearty whole grains to give me energy that lasts. Grain bowls keep me more satisfied too. 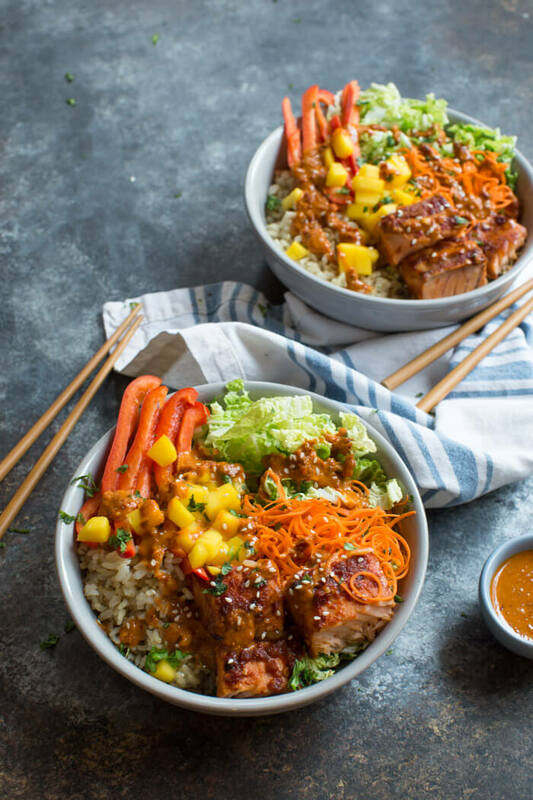 And that’s why I’m so LOVING these Spicy Thai Salmon Grain Bowls right now. This recipe was created with Thrive® Algae Oil, an earth friendly oil made from algae. And the best part is that it has a light, neutral taste that lets the fresh flavors of your food shine through. Thrive® Algae Oil has a bunch of great health benefits too! The oil has a high percentage of monounsaturated fat, a good fat that helps maintain heart health, and contains 75% less saturated fat than olive oil. Aside from those great health benefits, I love cooking with Thrive® Algae Oil because it has a high smoke point of up to 485 degrees! Meaning it’s safe to use for high temperature cooking like roasting, grilling, searing and pan frying. Not to mention its light, neutral taste, which makes it a great addition to salad dressings and baked goods. 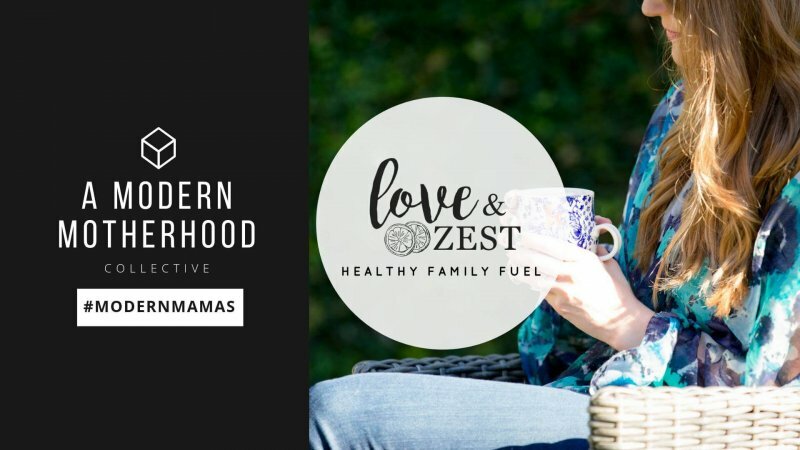 This oil is so versatile, it’s become a favorite in my kitchen. 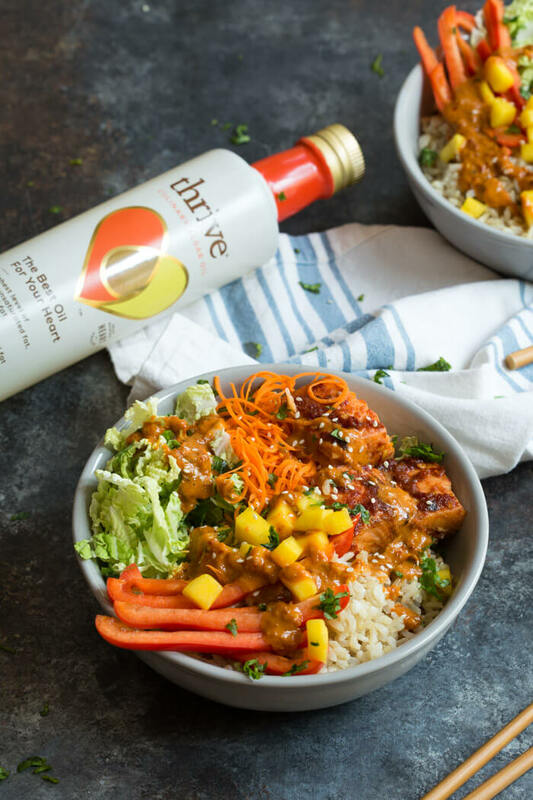 I discovered Thrive® Algae Oil at my local Earth Fare–check their website to find the store closest to you or find it on Amazon! 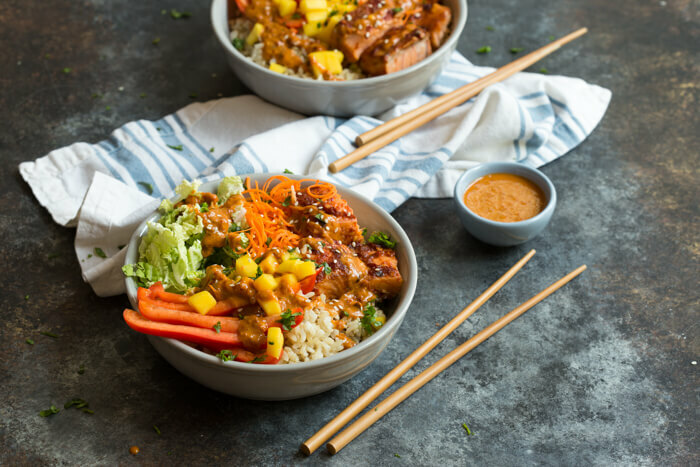 Spicy Thai Salmon Grain Bowls, grab your chopsticks and dig in! 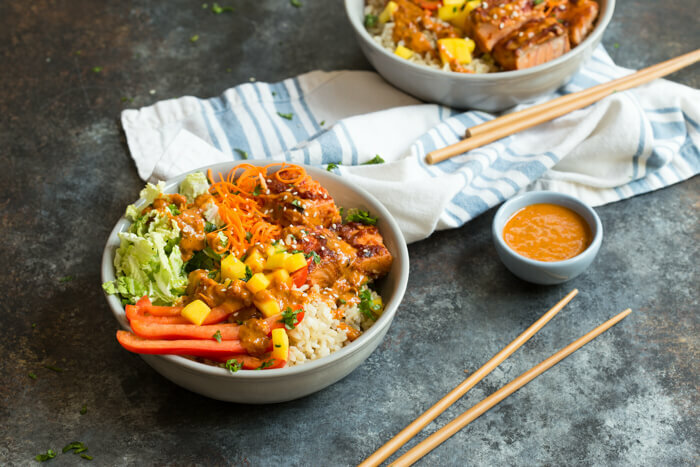 Spicy Thai Salmon Grain Bowls loaded with veggies, brown basmati rice and warm baked salmon and a drizzle of spicy Thai sauce. Because meals are better in bowl form. Preheat oven to 400 degrees F. Place salmon on a baking sheet lined with parchment paper. 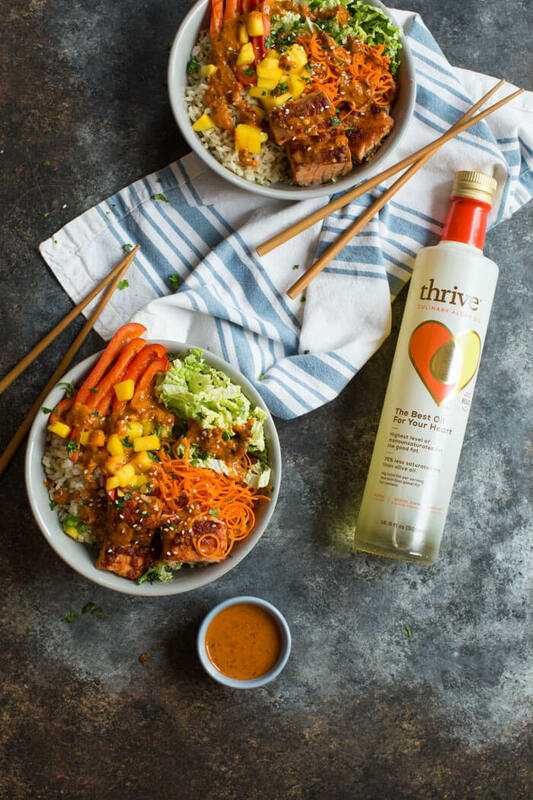 Rub salmon with chili garlic sauce, soy sauce and drizzle with 2 teaspoons Thrive® Algae Oil. Bake salmon for 12-15 minutes until fully cooked. Once cooked, slice salmon into cubes. Prepare the spicy thai sauce in a small bowl by whisking together the chili garlic sauce, soy sauce, minced ginger, peanut butter, honey and rice vinegar. Fluff cooked brown rice with 1 teaspoon of Thrive® Algae Oil to keep moist and flavorful. 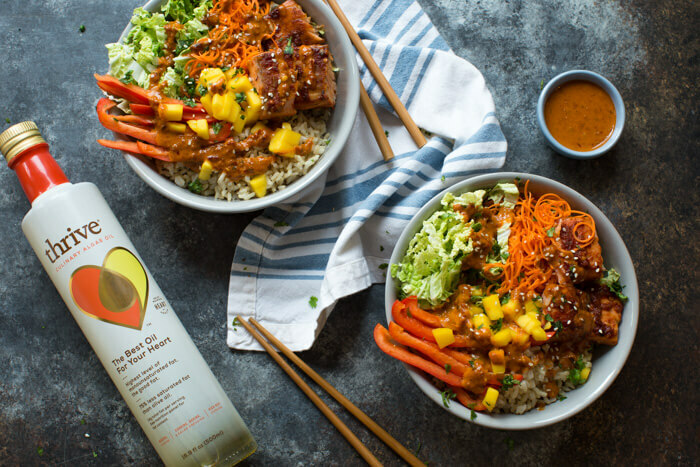 Assemble bowls by arranging brown rice, cabbage, bell pepper, mango, carrots, cooked salmon, and top with cilantro, a drizzle of chili garlic sauce and sesame seeds for garnish if desired. Love dishes like this – Healthy AND flavorful! This looks amazing. Planning on making this week! These look awesome! 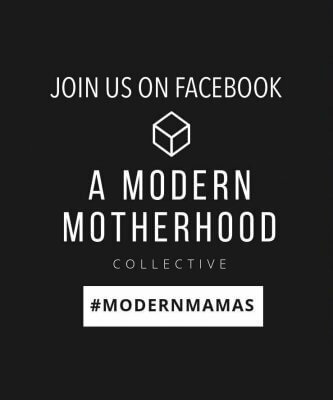 Pinning, sharing, AND making! Such a flavorful recipe with a mix of spicy, sweet and crunchy! And thanks for introducing me to Algae oil–haven’t heard of it yet! These bowls are gorgeous and I’m a HUGE fan of Thrive Algae oil! Definitely want to try this recipe! Algae oil?! I’d never heard of it! I’m so intrigued, not to mention in love with this recipe. I love all things Thai and have been craving salmon lately! You had me at mango! This bowl seems perfect for summer! I have never heard of algae oil before… who knew?! These bowls look like they would be perfect for me to take to work. Algae oil I sent new to me, but I know it’s super healthy. I already add algae to smoothies and what not so this has to be a winner as well! So this got pinned immediately haha. Also need to check out this oil! Bowls are 100% how I survive!! I am trying to eat salmon at least once a week too, so this is great to help mix things up. This looks so delicious! Love salmon! I’m so excited to try this recipe!! 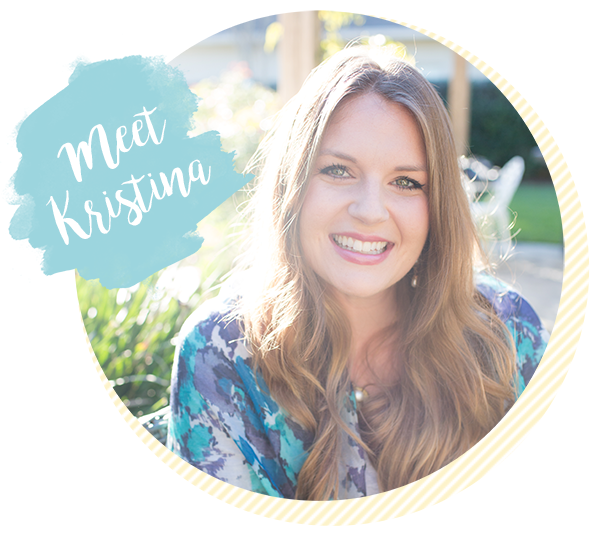 It has so many things I love – algae oil, salmon, MANGO – and it comes in a bowl! Doesn’t get better than that! I can just see how much flavor this bowl has. I really must give it a try. Algae Oil? Never heard of this one. Is it required for this recipe, or would olive oil suffice? ALGAE oil!!! Are you serious!!! How exciting! I must, MUST try this – adding it to this week’s grocery list! First, these bowls are almost too gorgeous to eat, and second, I’ve never heard of this kind of oil and now I’m obsessed, it sounds fascinating, I’m going to try to find some this week!